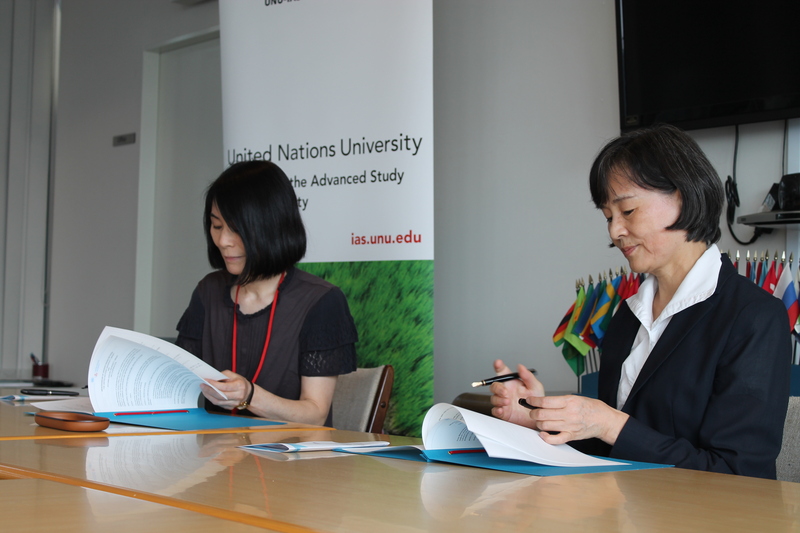 On 31 July 2015, representatives of UNU and Aoyama Gakuin University Libraries signed a Memorandum of Understanding on Cooperation. Through signing of this agreement, the two institutions have not only formalized their long-standing good relations but have also agreed to further deepen collaboration and to open new opportunities for academic exchange between students and teaching staff. The history of good relations between UNU and Aoyama Gakuin University goes back as many as 22 years. As Mayako Matsuki (Head Librarian, UNU-IAS) stressed, “being located in close proximity from each other, it was only natural for the two libraries to establish strong informal links early on”. Since 1993, the Aoyama Gakuin Univeristy Library has generously supported the UNU Library since its establishment in the present building in 1993 and urged for close cooperation between the two. The new MOU will thus serve as much more than a recognition of the existing relations, but further enhance the exchange of knowledge between students and researchers of UNU and Aoyama Gakuin. Prof. Yumiko Mimura (Aoyama Gakuin University) expressed her hopes for the two libraries to serve as extensions of campuses that would collaborate more closely on organization of various events. UNU-IAS — the largest research institute of the UNU System, welcomes this initiative and anticipates that it will support the academic missions of both universities. More information about the UNU Library can be found on the Library website.